Take a stroll in our Somersby gardens and captivate you senses with the alluring scent of Violets.Drawing inspiration from the English heritage with it's appealing cottage gardens and culture of appreciation for all things traditional. 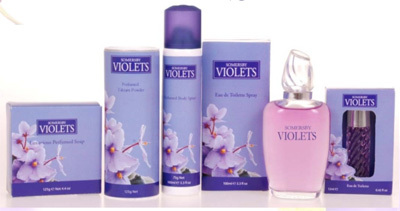 Somersby Violets presents a classic a floral range that has timeless appeal with it's elegance and beautiful feminine scent. This indulgent range will appeal to the consumer that enjoys fine floral toiletries and loves showcasing pretty packaging on their dressing table. A floral range that stands alone with it's affordable price point. Capture the essence of blossoming Violets with this delicately crafted fragrance. A triple milled cleansing soap that will leave your skin feeling soft & beautifully scented. An absorbent talcum powder that will leave your skin smooth & beautifully scented.